After my post about Tot School last week, we have totally switched our daily schedule around to be sure to give K some focused “Tot School” time each day. I am trying to provide a learning opportunity for him to explore and learn through, each morning. I will be writing more about this on my blog as I know there’s a lot of readers who are homeschooling kids and have toddlers at home too! I LOVE reading ideas from others about what they are doing with their tots, so I thought maybe someone might like to see what we’re doing around here! I read a great post from One Little, Two Little that focused on this and I loved seeing her idea about the seashell experience she offered her daughter. My oldest is really enjoying this too as he assists me in the “teaching,” and joins in the playing. It is allowing many of his character issues to be addressed as he learns that it isn’t all about him during that time. 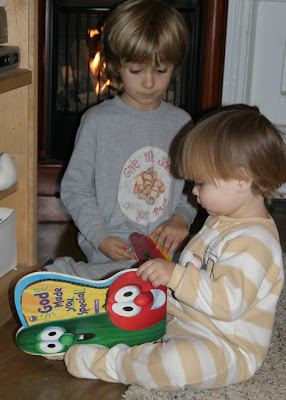 He’s learning to be kind, loving, gentle, and how to encourage learning…not FORCE it :). I do have a degree in Early Childhood Ed, I figured I’d better be using all of that knowledge we paid for and provide the best learning environment for my tot! You’ll begin to read more about what I believe about educating young ones too. I just really feel called to offer my best to both of my boys, not just the one with the textbooks! 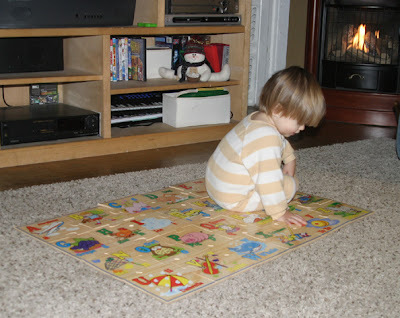 I decided I would pull out the big wooden ABC floor puzzle and let K explore it. I believe in letting a tot explore an item fully before trying to teach them anything. He played with the pieces for awhile and then big bro began putting the puzzle together, all the while I’m kinda staying out of it (sitting in my chair taking pictures 🙂 ). Soon I noticed P looking for a certain piece, I found it and gave it to K and told him to give the P to P…he did this with several other letters. 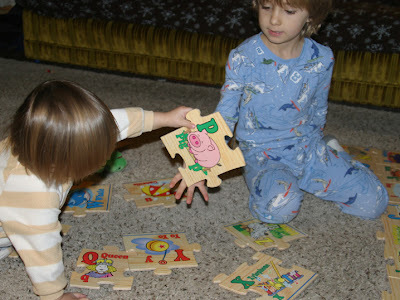 Then the puzzle was finished and K led P in a walk around the puzzle. 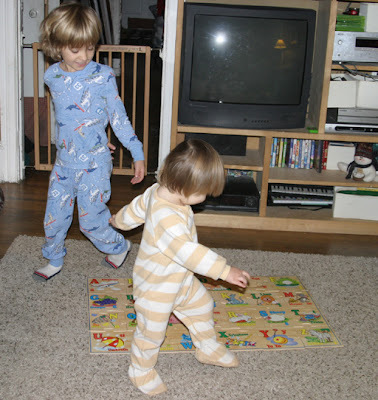 P desperately wanted K to learn his ABC’s, but I guided him to join in and follow K’s lead. K did eventually want to find some pictures and letters and we had a good time with the boys taking turns jumping on different pictures and letters… And then, he lost interest. I believe in stopping whenever that is. Whether it is 5 minutes into it or 15 minutes, when they’re done, they’re done! K went over and grabbed his Larry books (which he LOVES) and puzzle time switched into reading time. Yes big bro had went upstairs to get dressed in the middle of this too :). More to come as I get posts together 🙂 today we had tons of fun! If anyone would ever be interested in joining in let me know and I will put up a Mr. Linky for Tot School, I’d love to see what your Tot School looks like!